ANANDPUR SAHIB, Oct 31  The first meeting of the National Committee for Tercentenary celebrations of the birth of the Khalsa will be held on November 5 at Delhi. JALANDHAR: Housewives here are looking for recipes that don't require onions as the price of this essential ingredient of Indian food refuses to come down from its all-time high of Rs 60 per kg. SAKRODI (Sangrur) Oct 31  Minister of State for Health and Family Welfare Inderjit Singh Zira has said the government plans a network of mobile dispensaries throughout the state. CHANDIGARH, Oct 30  While Punjab Government is showing some determination to complete the much-touted Ranjit Sagar Dam by February 12, finances could finally delay it once again. GURDASPUR, Oct 31  Farmers, arhtias and rice millers are a harassed lot in the district due to the non-lifting of paddy by the FCI. 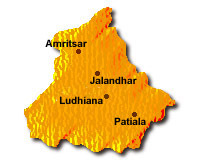 LUDHIANA, Oct 31  The Education Department, with the active involvement of students and the public, will launch a comprehensive campaign against the use of intoxicants and abortion of female foetuses. AMRITSAR, Oct 31  It won't be an ordinary bus. After more than 50 years of independence, bus service between India and Pakistan will be started for the first time on November 6. PATIALA, Oct 31  Punjab Chief Minister Parkash Singh Badal today said the government was open to the idea of expanding the jurisdiction of the State Human Rights Commission. CHANDIGARH, Oct 31  The Punjab Government has requested the repatriation of Mr D P Reddy, an IAS officer of the Punjab cadre, who is posted as a Senior Regional Manager of the Food Corporation of India here, it is learnt. CHANDIGARH, Oct 31  Unaided private recognised engineering colleges have requested the Punjab Government to relax conditions to fill the vacant seats in 'paid category' in these institutions. ANANDPUR SAHIB, Oct 31  The first meeting of the National Committee for Tercentenary celebrations of the birth of the Khalsa will be held on November 5 at Delhi. It will be presided over by the Prime Minister, Atal Behari Vajpayee, and Chief Ministers of all states will attend. Addressing a press conference here today, the State Finance Minister, Capt Kanwaljit Singh, said an agenda for celebrating this mega event at a national and international level in April 1999, had already been issued to the members. The minister said Haryana, Gujarat, Maharashtra had so far formed state-level committees to celebrate the tercentenary. He also conveyed his thanks to the Chief Ministers of these states and hoped that other states would follow the suit. Capt Kanwaljit Singh, who earlier presided over a high-level meeting in connection with the preparations of the foundation stone laying ceremony of the Khalsa Heritage Memorial Complex on November 22, said a 16-ft-high white marble piece, brought from Makrana (Rajasthan), would be laid at the site of the complex near kila Anandgarh Sahib here by the Panj Piaras. He said the foundation stone would be prepared by artisans who had been called from Agra. The minister also said the foundation stone laying ceremony would be telecast live for which 30 TV teams had already confirmed their arrivals on the day. He also said that eminent NRIs from eight to 10 countries had been invited to participate . Top political personalities along with chiefs of various Sikh sects and other religions from all over the countries had also been invited. However, he said that those, who had been ex-communicated from the Sikh Panth would not be invited. Regarding arrangements for the November 22 function, the minister said all projects would be completed by November 15, which included the preparation of the foundation stone, roads, procession route, approval to the design of five gates to be named after "Panj-Piaras" etc. Later, Capt Kanwaljit Singh along with Prof Manjit Singh, Jathedar of Takht Sri Keshgarh Sahib; Mr G.S. Cheema, Chief Administrator of the Anandpur Sahib Projects, Mr D.S. Jaspal , Head of Anandpur Sahib Foundation; Mr J.S. Kesar, Secretary, Public Relations and Mr Kulbir Singh Sidhu, DC, Ropar, visited the site of the complex. JALANDHAR: Housewives here are looking for recipes that don't require onions as the price of this essential ingredient of Indian food refuses to come down from its all-time high of Rs 60 per kg. But onion is not the only vegetable disappearing from the dining table. The unprecedented price hike of nearly 50 per cent in all essential food stuffs has thrown household budget haywire. With the price hike hitting all segments the people here are blaming the BJP-led government of helping traders hoard and sell these commodities at exorbitant rates. The government is also being blamed for not conducting any raids and prosecuting black marketeers. Talking to TNS here today, Ms Rani Rajpal, a business woman alleged that the government had totally failed to control the situation. She said "it's nearly 2 months since the onion prices shot up, and all that the Prime Minister did was issue a warning to the hoarders. But where are the raids? And now, the privileged voters of Delhi will be given onions at outlets of Safal at the rate of Rs 15 per kg, while the rest of the country fends for itself." While Ms Sangeeta Sharma said that the rise in prices of essential commodities has added to the misery of the common man, already hit with a 44 per cent hike in bus fares and 18 per cent hike in power tariff. If one adds up, the current prices of food the citizen has never had it so bad, she said. According to Dr Seema, the salaried class budget is a shambles, the phenomenal hike is because of political patronage and an insensitive government. The so-called system has totally failed and needs revamping. The government should have woken up much earlier and placed a ban on export of onions, she said. First we sell onions at lower rates to foreign countries when we know that the crop has been damaged and supply will not fulfil the demand and now we are importing the same onions at a higher rate. While Mrs Sushma Mahajan, a housewife, lamented that the family was already doing without onions. But now potatoes too are selling at Rs 25. What do we feed our children? she asked. Ms Achal Verma, another housewife said it's the sheer lack of political will and total failure of the government in taking action against hoarders and big traders who are making hay at the cost of the consumer. Retail prices of essential commodities in Jalandhar on Wednesday were vegetables and fruit (per kg): cauliflower Rs 25, cabbage Rs 24,onions Rs 50, radish Rs 15, lady finger Rs 16, lemon Rs 40, capsicum Rs 35, tomatoes Rs 20, potato Rs 17-18, ginger Rs 24, ghia Rs 12-15, khira Rs 12, beans Rs 14. Apples Shimla royal Rs 25, apples Kinnaur royal Rs 35, apples golden Rs 25, and bananas per dozen Rs 20. Pulses and other items of daily use: rajmah Rs 32, arhar Rs 42, dal chana Rs 20, white gram Rs 37, moong dal Rs 30, moong Rs 28, mah Rs 25, black gram Rs 18, malika massoor Rs 30, atta Rs 9-9.30, sooji Rs 16, besan Rs 22, vegetable oil Rs 62 per litre and mustard oil Rs 65 to 70 per litre. This multipurpose hydel project, one of the largest river valley projects on the Ravi, started way back in 1979, should have been completed by 1986 in less than Rs 1000 crore. But the cost due to delay has shot up to Rs 3200 crore now. Punjab is losing over Rs 2 crore each day. Had the project been completed on time, it would have added many times more to the kitty of the government. Cost escalation, too, could have been avoided. It has been a typical case of planning without mind and money. In fact, even if the increased cost of Rs 3200 crore is taken into account, the project would return it in about four years. But somehow, it became a plaything in the hands of politicians of all hues, here as well as at the Centre. The dam now needs Rs 300 crore. Of this Rs 150 crore is to come from the centre under accelerated irrigation project scheme and the rest from the coffers of the Punjab Government. According to Finance Minister, Capt Kanwaljit Singh who has been taking keen interest, the government shall provide funds and see that the dam is completed by mid-February 1999. But sources in the department said that it is big job to provide this much. It would be at the cost of some other project, it was pointed out. The 600 MW power plant would generate 1500 million units of electricity annually. There would be additional irrigation for 3.5 lakh hectares in the districts of Amritsar and Gurdaspur. The project authorities estimate that the increase in industrial and agriculture production would add Rs 550 crore and the sale of energy Rs 300 crore. Thus for one year, the gain would be in the order of Rs 850 crore. Ranjit Sagar Dam earlier known as Thein Dam, has a sad history. Over the past nearly 20 years, it had many, slips, largely due to paucity of fund and violence. Several Chief Ministers tried their best to manage funds to claim the credit. But the slips remained and hence the cost escalation. The project report was first submitted by the Punjab Government in 1964. Tragically it was cleared in 1982 for Rs 242.43 crore. The Chief Minister, Mr Parkash Singh Badal, had signed agreement with the then Chief Minister of Jammu and Kashmir, Sheikh Abdullah in 1979. Later an agreement was signed with Himachal Pradesh. First allocation was for Rs 32 lakh only. Work began in 1982. During the three years when Mr Badal was at the helm a total of Rs 10 crore was made available. But there was a drastic reduction later. Chief Ministers like Mr Darbara Singh and Mr Surjit Singh Barnala made some solid contribution. During the tenure of Mr Beant Singh, it drew attention again and one major milestone  the diversion tunnel  was achieved in November 1997. It was then declared that the project would be completed by November 1997. While floods played havoc with the work in 1988, it got delayed later due to shortage of funds and agitations. The work on the project is indeed hazardous. Over 16,000 work force is there. As many as 300 workers have lost their lives in accidents at the work site. Talking to mediapersons here last night, he said such dispensaries were already functioning in Gidderbaha, Dakala, Banur and Jalandhar. He said stress would be on augmenting the mobile dispensary service as existing dispensaries were proving incapable of providing good health care to the rural people. Mr Zira said a panel would be appointed to look into the increasing number of doctors in Punjab Government service working on deputation in urban areas. The minister announced that a Bill would be introduced in the coming assembly session making it necessary for private nursing homes to recruit only trained medical and paramedical staff. He said under a new scheme duplicate prescription slips were being issued in government dispensaries in the state to check pilferage of medicines from government hospitals. Under the scheme, patients were required to hand over a signed copy of the duplicate prescription slip to the chemist while one slip was kept as record in the dispensary. Mr Zira said the practice of surprise visits to government dispensaries and hospitals started by him had been a success. He said attendance in the outpatient departments (OPDs) had gone up by 70 to 80 per cent. This had also resulted in punctuality among doctors in healthcare institutions. Mr Zira called upon sarpanches and panches in villages to keep a watch on the functioning of healthcare institutions in their areas and report any deficiency to the Health Department. He said all such complaints would be dealt with on a priority basis. Three doctors  Dr D.C. Sharma, Dr Dharmvir Singh Gandhi and Dr Surinder Singla  were honoured on the occasion. Mr Zira distributed 11 cheques of Rs 50,000 each to village panchayats out of Union Minister Surjit Singh Barnala's discretionary fund. GURDASPUR, Oct 31  Farmers, arhtias and rice millers are a harassed lot in the district due to the non-lifting of paddy by the FCI. According to Mr Baljinder Singh, president, Rice Millers Association, Gurdaspur, more than 4,000 wagons of recently shelled rice are lying with the millers till date. Rice worth about Rs 80 crore is piled up. The millers cannot make payment to the arhtias till the rice is lifted by the FCI. Mr Singh said the specification of rice relaxed by the Centre have been done to 22 per cent broken from 18 per cent broken earlier. He said due to inclement weather paddy growers harvested paddy with the help of combines. The rice shelled out of combine harvested paddy gives 30 per cent broken rice which is not acceptable to the FCI. He demanded the relaxation in the specifications. Mr Kirpal Singh, president, Beas Bet Arhtia Association, told this correspondent that most of the paddy was purchased by the millers and payment to the farmers had become overdue due to the non-payment to arhtias by the millers. He demanded the immediate lifting of piled up rice with the millers by the FCI to ease the situation. Mr Daler Singh, a farmer of Babowal village, said he has harvested 10 acres of paddy and rushed the produce to the market more than a month ago but has not been able to get full payment to meet his everyday needs. He said the delay in the payment would affect the timely cultivation of rabi crop because farmers will not be able to purchase the desired quantity of fertilisers. According to official sources, the rice millers purchased most of the paddy because they were getting ample orders from exporters. Now that the exporters have turned their back, the millers are finding it difficult to make payment to the arhtias because of huge stocks of rice lying in the godowns. PHAGWARA: The former chairman of the local market committee and Akali leader, Mr Jagat Singh Palahi, today alleged that farmers of the Phagwara block were not getting DAP fertiliser since the share of the block had been diverted to another block and not a single bag of DAP fertiliser was available with cooperative societies of the area and were running from pillar to post for it alleged Palahi. He said he had raised the issue with district officials yet nothing had been done. MOGA: Punjab will fall short of achieving its paddy procurement target of 1.20 crore metric tonne due to low yield following recent unseasonal rain which damaged at least 25 lakh metric tonne of the crop. Food and Supplies Minister Madan Mohan Mittal told mediapersons here last night that till yesterday, the state had procured 74,63,678 metric tonne of paddy against a target of 1.20 crore tonne. Out of this, the FCI has procured 17,63,000 metric tonnes while the state Food and Supplies Department has procured 27.52 lakh tonne whereas millers and traders has purchased 50,45,507 metric tonne. This was announced by Mr Tota Singh, Education Minister, Punjab, at a prize distribution function at Master Tara Singh Memorial College for Women, here today. The minister exhorted the girl students in particular to make this campaign a mass movement. He announced that the adjoining land of Government Primary School, which had only seven students, would be transferred to the college for building a technical education block. In the shabad singing context Guru Nanak International Public School and Guru Nanak Public School won the first place. Ramgarhia Senior Secondary School and Sat Guru Partap Singh Academy came second while Harkishan Public School and Government Blind Institution, Jamalpur, won the third position. The 56-seater de luxe DTC bus will cover 500 km a day between Delhi and Lahore. The bus will be run on a trial basis on November 2 under a high security cover. The bus will halt at Kartarpur Sahib and Sirhind (Punjab) before entering the territory of Haryana. While the elite in both countries prefer to travel by air, the bus service facility will be availed by the middle class in the two countries. The decision to start the bus service was the result of talks between Prime Minister Atal Behari Vajpayee and his Pakistani counterpart Nawaz Sharif in New York recently. Security officials of Punjab, Haryana and Delhi have been holding high-level meetings to make necessary arrangements for the bus service. The bus is scheduled to halt at different places en route to Delhi and security personnel feel that they will come in close contact with the local population at these points. Hence, necessary precautions against anti-social elements are a must. Questions are being raised on the smooth running of the international bus. People feel that the smooth running of the bus will depend largely on the mutual relations between the two countries. FEROZEPORE, Oct 31  Punsup will soon invite tenders to import onions from abroad giving this information, the Minister for Food and Supply, Mr Madan Mohan Mittal said, he had learnt that onion stocks had finished in Pakistan and Iran. They were expected to be imported from Dubai now, he added. Mr Mittal was here yesterday to preside over a meeting of the district officers of the government procurement agencies and review the work of procurement and lifting of paddy. Talking to mediapersons, he said the Centre had done well in giving relaxation up to 8 per cent from the previous 2 per cent in the procurement of discoloured and damaged paddy. The farmers of the state would get benefit between 20 and 30 per cent due to this relaxation in the specifications of paddy, he claimed. The minister said directions had been issued to the heads of government agencies to persuade the rice-millers to purchase at the reasonable rates, discoloured and damaged paddy which was above the enhanced specifications. To a question he said, the state government would not allow the prices of pulses and other essential commodities to go up. The prices of onions had risen due to natural calamity, he added. Regarding the shortage of DAP fertiliser in the market, he said the matter was under consideration of the Union Food and Chemicals Minister, Mr Surjit Singh Barnala, who had held a meeting in Delhi on October 28 to ensure the adequate supply of DAP fertiliser. Talking to newsmen here after addressing a congregation on the occasion of Baba Namdev's 728th birth anniversary at Singh Sabha Gurdwara, Mr Badal said the government would expand the jurisdiction of the commission if Justice Kuldeep Singh so desired. Mr Badal said the party would be streamlined after the Adampur byelection. When queried whether it would mean reorganisation of the party, the Chief Minister said all aspects would be looked into after a series of meetings at the grassroots level. Earlier addressing the congregation at the gurdwara, the Chief Minister defended the government decision to spend crores of rupees on the 300th anniversary of the birth of the Khalsa he said the anniversary celebrations would help bring about a "revolutionary" change. CHANDIGARH, Oct 31  The Punjab Government has requested the repatriation of Mr D P Reddy, an IAS officer of the Punjab cadre, who is posted as a Senior Regional Manager of the Food Corporation of India (FCI) here, it is learnt. Mr Reddy had gone on deputation to the Central Government only two months back. Earlier he was posted as Additional Principal Secretary to the Punjab Chief Minister, Mr Parkash Singh Badal. Informed official sources told TNS today that the State Government in a request sent to the Union Ministry for Personnel had stated that Mr Reddy's services were required by the Punjab Government urgently. Mr Reddy, if repatriated, will be the fourth senior regional manager to be changed from the local regional office of the FCI within past six months. After the repatriation of Mr Sarvesh Kaushal, a Punjab cadre IAS officer who served as a Senior Regional Manager for almost the full term of five years and came back to the home cadre following promotion, Mr D K Dhawan was appointed officiating Senior Regional Manager about six months ago. Mr Dhawan was replaced soon and in his place Mr S S Bhatoa joined as Senior Regional Manager and he also stayed for a brief period. In his place Mr H L Parsad was posted who also had a very brief stint. Mr Reddy replaced Mr Parsad. According to the Punjab Unaided Technical Institutions Association 400 seats were vacant in the paid category in these colleges. In these institutions seats were filled on the basis of CET merit. While 50 per cent admissions were made without getting any payment except tuition fee from students, the remaining seats are filled by getting charges fixed by the state Government. For instance, an NRI student has to pay about Rs 8 lakh for complete degree course in these colleges. Association representatives said that their institutions were facing crisis in the absence of filling of paid seats. Out of vacant seats, five per cent are of NRI quota. Earlier from these seats institutions used to collect a good amount to run the institutions. Association representatives have urged the Punjab Government to waive the condition of domicile and allow students from other states to take admission in these colleges. They have also requested to do away with the condition of filling such seats from CET merit. As CET result was challenged in the court this year, admission in all engineering colleges was delayed and students who were to get admission in Punjab under the paid category got admission in other states. CHANDIGARH, Oct 31  A three-day workshop for science writers organised by the Punjab State Council for Science and Technology concluded here today. Among participants were lecturers from schools and colleges, members of voluntary organisations and journalists. Its main objectives were: to encourage science reporting, to prompt writing on science in skits, short stories. Among those who spoke were Mr RK Sahai, CSIR, Mr RD Rikhari, NRDC , Mr Vineeta Singhal, NISC, Dr Gian Singh. NISC, Ms Rama Rattan, and Dr Manoj Patairiya. BATALA, Oct 31  The Dera Baba Nanak police claims to have unearthed the mystery behind the disappearance of Bant Ram, a resident of Talwandi Rama. The state police chief, Mr Lok Nath Angara, told mediapersons here today that the police had arrested Rajinder Kumar and Raj Kumar, sons of Hans Raj, a resident of Talwandi Rama who had killed Bant Ram on August 15. Mr Angara said the accused were nephews of Bant Ram. The investigations revealed that Bant Ram had used to make passes at Raj Kumars wife. Enraged the two brothers invited their uncle to their house and killed him and threw his body in a canal. A case under Sections 304/201/34 of the IPC has been registered. BATHINDA, Oct 31  Two persons, namely Harpal Singh and Rasal Singh, were shot dead in their fields late last night. According to Mr M.S. Chinna, SP (D), three others who had been identified went to the field of Jagroop Singh where his son Harpal Singh along with the farm help Rasal Singh was present. Mr Chinna along with the SSP, Mr Harnek Singh, went to the site of crime. A case under Sections 302 and 34 of the IPC and the Arms Act had been registered against the accused and police parties had been dispatched to nab the suspects. AMRITSAR, Oct 31  The British Broadcasting Corporation (BBC) will produce three documentary films on Sikhs and Sikhism which will cover Operation Bluestar and the anti-Sikh riots. The films will be of half-an-hour duration each, and are being produced as part of tercentenary celebrations of the birth of the Khalsa. Mr Tommy Nagra, producer of the BBC, has already reached here along with his team for the purpose. PATIALA, Oct 31  The Patiala police has solved the eight-month-old Passiana murder case with the arrest of Suresh Pal and Baldev Singh, brothers-in-law of Tej Kaur, who was murdered on March 11 this year. Stating this here yesterday, Inspector-General of Police R S Gill said the parents of the accused had also been arrested. He said the case had been solved with the help of the Forensic Science Laboratory, Chandigarh, which used the superimposition technique to match the bite marks inflicted on the check of Tej Kaur by one of the accused with the denture casts of the suspects. He said the victim's body was found from an abandoned well 100 metres from her house and the post-mortem report had confirmed death by strangulation. Mr Gill said the denture cast of the bite mark was made when no headway could be made in the case. He said the investigation of the case had been done by Ms V. Neerja who was posted as SP, Headquarters, Barnala. CHANDIGARH, Oct 31  The Physical Handicapped Association, Punjab, is organising a state-level rehabilitation and awareness camp for the disabled on November 7 at Baba Vishwakarma Ground in Dinanagar in Gurdaspur district. According to a press note here today, as many as 1,000 disabled from different parts of the state will attend the meet. As part of the rehabilitation programme, besides loan forms, sewing machines, wheel chairs, crutches and blankets will be distributed among the handicapped. PHILLAUR, Oct 31  The DGP, Mr P.C. Dogra, inaugurated a two-day seminar on Sufi studies organised by the Punjab Police Academy here today. The DGP said Sufi traditions had the rich ingredients of India's composite cultural heritage and was linked with the Bhakti movement. Its philosophy bound people together in bonds of brotherhood and taught love, compassion and concern. Mr Dogra saw the holding of the seminar on Sufi studies as an important step towards changing the popular perception about the police that it was a brute, danda-wielding force. Earlier, Mr A.A. Siddiqui, Director of the academy, said the Sufism might not be strictly related to the police but the fact remained that a large number of evils afflicting the society could be eliminated if people followed some of the principles of Sufism. Mr Nissar Ahmed Farooqi and Mr Shams-ur-Rehman Farooqui read papers on various aspects of Sufism in India. FEROZEPORE, Oct 31  A total of five benches of judges were constituted to provide on-the-spot justice in the Lok Adalat organised here today under the Chairmanship of the district and Sessions Judge, Mr M M Bhalla. Mr AB Saharya, Chief Justice of the Punjab and Haryana High Court, inspected the Lok Adalat, in which 24 out of a total of 82 cases were decided on the spot. A total of about Rs 10.49 lakh were realised in the cases settled. The next Lok Adalat will be held on November 9. Meanwhile, Mr Justice Shaharya told reporters that he inspected the local courts also and held a meeting with judicial officers who were issued necessary directions to streamline the functioning of courts. JALANDHAR, Oct 31  The three-day Harballabh Sangeet Sammelan will be held from December 25, at Devi Talab Mandir here, according to Mr Alok Sondhi, organising secretary, Baba Harballabh Sangeet Mahasabha. In a press statement Mr Sondhi said leading artistes of Hindustani classical music had been invited to perform this year. The sammelan was started in 1875 by Baba Harballabh who was a saint and a great musician in memory of his Guru Tuljagiri Ji. CHANDIGARH, Oct 31  The nagar kirtan tal mel committee which met today under the chairmanship of Major N.S. Rangi at the Sector 34 gurdwara decided to take out a colourful nagar kirtan procession on November 2 to mark the birth anniversary of Guru Nanak Dev. The procession will start from the Sector 19 Gurdwara Singh Sabha at mid-day and move through sectors 19, 27, 28, 29, 30, 20, 21, 22 and 23 before terminating at the Sector 23 gurdwara.